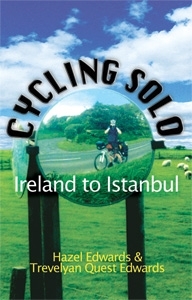 From Ireland to Istanbul with bike and blog. Blogging is the new electronic autobiography! In "Cycling Solo", Trevelyan has found his voice, but the bike is in bits! 29-year-old cyclist cartographer Trevelyan is a candid observer as well as a survivor; camping on a budget of next-to-nothing while cycling alone for five months. No watch, just a compass and a web log (blog). From Ireland to Istanbul, with forgettable campsites, random kindnesses, punctures, falls and steep kilometres in between, this off-best quest with the upside down "Reflection of Blogging Bicycology" from a home viewpoint is worth sharing. Quest is his real middle name. Mother-son co-authors are unusual collaborators but at three, Trevelyan inspired "There's a Hippopotamus on Our Roof Eating Cake", and recently helped with Darwin research for the novel "Outback Ferals". Orienteering was a family sport which meant map reading and getting lost were weekly challenges, but the family that writes and explores together, stays together.